Do you ever play the comparison game? The one where you measure your worth based on how you stack up compared to the people around you? If this were a sport, I’d most likely have a trophy case filled with dust-coated awards. We must know that much of our comparison game playing is useless as it only makes us feel badly about ourselves. What’s worse is making our comparison game about things unworthy of our attention. I remember when the hubs and I first moved to the tundra and bought a house. We were eager to make a few cosmetic improvements, including new flooring. But before making a final decision about flooring, the owner of the flooring store suggested we visit a home of one of his satisfied customers. We did and their flooring looked great. But that wasn’t all that looked great. The entire home looked pretty great, i.e. better than mine–newer, bigger, and with amenities we could not afford. Worst of all, those very nice homeowners had the audacity to look several years younger than the hubs and me! I pouted in the car on the way home. The hubs asked what was wrong and I lamented over how that young couple had a nicer home than us and how it seemed unacceptable since we were obviously at similar life stages. Had we fallen behind? Had we chosen wrong careers? Was life simply unfair? When I raised my eyebrows at his remark, he continued… “No matter how nice a home we buy, there will always be someone with a nicer one.” In other words, there is no end to the path of dissatisfaction. I settled myself, chastened. The hubs is a good man. The comparison game can still be a struggle for me, albeit less so when it comes to counting other people’s money. We are fortunate in that our economic circumstance is mostly the result of conscious lifestyle choices and we don’t lack for any necessities and many luxuries. Plus, I no longer desire a bigger house to decorate, heat or clean. I’m not even much interested in cleaning or updating the home we’ve now lived in for over 15 years. These days, I’m not much into “stuff” as a measurement of my worth. But I do believe there are some suitable measurements against which to gage our performance. For example, I follow the work of other editors and writers and when I discover something praise-worthy, like a beautiful web design or a well-written essay, I want to up my game. I want to do my job well, and hopefully, I will continue to get better by comparing myself to those who do it better. Some of my friends are great cooks. Others exercise more than me, which isn’t hard to do, but is still admirable. Some folks seek lifelong learning opportunities, travel more, read more and volunteer more. I don’t feel it’s wrong to compare myself to these people–not to shame myself or feel badly about my chosen lifestyle–but to be inspired toward living a more useful life. One of the women talked about how she is trying to read the bible more. Not books about the bible. Not bible studies. Just plain old digging into God’s Word. Not alone at night before bed or during the early morning hours, but daily at times she would most likely be seen by her children. 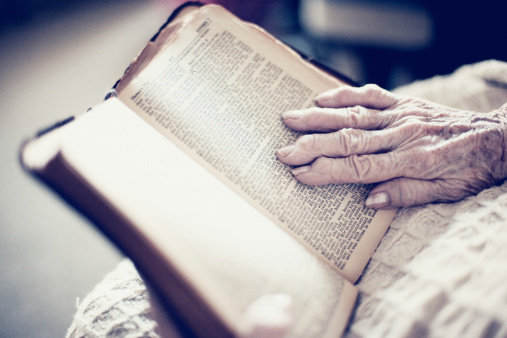 She spoke of wanting to leave, at the end of her life, a worn and dog-eared bible and memories for her children of regularly having seen their mother immersed in a biblical search for understanding, guidance and encouragement. What a legacy–better than any financial success, career accomplishment or dedication to any particular beauty or fitness routine. I willingly and humbly compare myself to this woman. And I do not measure up. But I pray that one day I will. ← What Kind of Friend Are You? Nope, I never compare myself. Just kidding. Like you said, some is only natural and not always a bad thing (like upping our game professionally). It takes so much experience and maturity and “grounded-ness” to not do it in the worst ways. I think I’ve grown out of many of those ways, thank GOD.